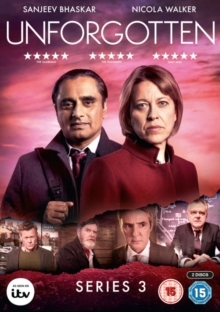 All six episodes from the third series of the ITV detective drama starring Nicola Walker and Sanjeev Bhaskar. DCI Cassie Stuart and DI Sunil Khan (Walker and Bhaskar)'s next big case begins when construction workers unearth human remains while carrying out repairs on the M1 motorway. After carrying out forensic analysis and some preliminary investigations, the pair determines the victim to be missing schoolgirl Hayley Reid, who disappeared on New Year's Day, 2000. Returning to the initial investigation of her disappearance, the detectives identify four possible suspects, but which one of them is responsible for Hayley's death?